CultureWorks honors our regions working artists, and their accomplishments, by supporting future projects that spotlight cultural equity or supporting efforts that add to their professional advancement. Learn more about the recipients of artists grants through the 2018 Annual Cycle. Sara is a multidisciplinary artist and composer who uses sound, installation and performance to interweave American histories and the landscape. She has exhibited and performed internationally, including at the Center for Book Arts (NYC), the American Folk Art Museum (NYC), the Berlin Underground (Germany), Third Practice Electroacoustic Music Festival (Richmond) and Sound Arts Richmond. Born in Stockton, CA, she received her BA from Yale University in 2003 and is currently an MFA candidate in Kinetic Imaging at VCUarts. Lean more about her work here. Alexis has been exploring clay for 11 years while also working as a professional photographer. She focuses on functional wares and has recently completed commissions for Sugar & Twine, Perch, Lucid Living and Accoutre. Emily has been working in ceramics for 10 years, she studied at VCUarts concentrating in Ceramics and Textiles and currently teaches youth and adult wheel throwing and handbuilding. Hand/Thrown is their studio dedicated to ceramic arts in Richmond's Northside. Hand/Thrown is committed to nurturing a community that welcomes both experienced and beginner ceramicists. Learn more about their work here. Free is an independent historical strategist and founder of Untold RVA. Her conspiracy of good people includes relentless guerrillas in public media, street art, academia, youth empowerment, political activism, spiritual elevation and community design using ancestral self determination to disrupt racist legacies of oppression. As a social innovator in residence at Six Points Innovation Center and the founder for Richmond's outpost for the United States Department of Arts and Culture, Free's groundbreaking projects are leading the front lines of what she has entitled the Commemorative Justice movement. Learn more about her work here. Dawn is a bio-inspired multidisciplinary artist and Creative Director for The Forest Project, which documented 60-acres of urban forest before it was clear-cut for development. As part of the project, she supervised volunteers in rescuing 2,000 plants, collecting millions of seeds and salvaging parts of an 1865 farmhouse. Photographs taken in the woods were made into patterns, printed on fabric and sewn into quilts. Trees cut from the forest were turned into bowls, hollow forms and other art objects. Eight volumes of photographs document the work. Learn more about her work here. Kevin is a life-long artist and tinkerer. Growing up in the Wonkaesque town of Hershey, Pennsylvania, he found much inspiration in being weird and rebellious. After graduating from Savannah College of Art and Design, Kevin found his way to Richmond. He and his wife Andrea founded Art on Wheels, which allows him to share discoveries with those who lack access to art and conceive outrageous and meaningful monumental art projects. He has shown his work at prestigious Virginia museums, exhibited internationally, and created his greatest masterpieces, a daughter named Ada, and son named Ellis. Learn more about his work here. Michael-Birch is a fiber artist and fashion designer. He received a B.F.A. in fashion design from VCU where he now teaches Fashion Design and Arts Foundation. He also studied at the Savannah College of Art and Design for an M.F.A. in fibers with a focus on embroidery and embellishment. 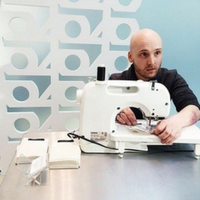 Pierce has interned for Diane von Furstenberg, designed and embroidered Christmas decorations for the Obama White House, and served as stylist for André Leon Talley's Little Black Dress costume exhibition. He has exhibited in numerous galleries and museums, and performed his embroidered portraits at Design/Miami, SXSW, and NY Fashion Week. Pierce is represented by Quirk Gallery. Learn more about his work here. Lynda graduated from Massachusetts College of Art in Boston, MA in 1987.She also attended Skowhegan School of Painting and Sculpture where she studied under Agnes Martin and Joseph Campbell. Thoughts she references are “perfection is in the mind” from Agnes and “work parallels the experience” from her professor Rob Moore. Ray has been awarded artist residencies at the Vermont Studio Colony, Santa Fe Art Institute, and Byrdcliffe Arts Colony, Woodstock, NY. She has received fellowships from the Massachusetts Artists Fellowship Program and The Sam and Adele Golden Foundation for the Arts, Inc. Learn more about her work here. Nastassja is a multidisciplinary artist and owner of D for Dolls. She received her Bachelors degree of Fine Art from Virginia Commonwealth University in 2018, with a major in Painting & Printmaking and a minor in Craft & Material Studies. Her work is reflective of childhood, girlhood and identity through the vessel of her needle felted work. She has participated in several national and international residences and exhibitions, including her solo exhibit in Doha, Qatar, and fellowships at the Vermont Studio Center and MASS MoCA. Learn more about her work here. Born and raised in the historic Jackson Ward of Richmond, James, creatively known as Sir James L. Thornhill is a gifted American artist Muralists and photographer. He attended Open High School with an emphasis on art and fashion designing and screen printing, and studied various art forms and mediums at VCU, Virginia Museum of Fine Arts, Richmond Technical Center, and John Tyler Community College. He has painted over 20 murals in Richmond, traveled throughout the world to photograph and paint, teaches with afterschool programs and the Mayors Youth Academy. Learn more about his work here.